Im a 39 year old mum of 2. I have struggled with my weight my entire life and although I enjoy exercise I have struggled to stick to a routine for years. The gym was just too intimidating and classes were too difficult to fit in around the family and a part time job. I have a long overseas trip planned and wanted to lose weight and also learn to run, so I can keep up a fitness regime while away in another country. After yo-yo dieting and trying every quick-fix weight loss plan I could find on the internet, I started this 8 week plan with apprehension but a strange eagerness to learn! My plan was to lose at least half a stone in 8 weeks (not easy for me!) and to learn to run…I have never been a runner and actually hate running but wanted to change how I felt. The plan is so easy to follow. Planning is key! You don’t need to know how or what to eat to start - as long as you record everything you eat, Lorna will comment and advise what to substitute, leave out or add in. Slowly but surely you will get to grips with what is good to eat and what to combine to give you energy and feel good. The Daily Article is fab…a lovely way to start the day. There is always a different focus and gives you something to think about and aim for. The daily exercises are planned out for you week by week and you can adjust and swap them to suit your times and days…they also slowly increase in difficulty but there is always an option for a slightly easier move…and its over within half an hour! Although I did struggle with some of the early ones, my fitness really improved over the weeks…so much so that in my final week I actually ran 5k without stopping!! I am so proud! I couldn't run 50m in the first week! The fitness test is a must…I didn't think I would improve very much but I was so wrong. I lost a total of 11lb in the 8 weeks. And its real weight loss - not just fast water loss that I would get with a quick fix and promptly put back on the next week! Plus, since finishing I have lost more. This really is a change for life. But the best thing is that I dropped 2 dress sizes!! My legs have definition they didn't have before and I lost a total of 13cm from around my tummy. I also lost 8cm off my bum and 3cm from each thigh and each arm. I’m amazed! Other people are now commenting on how different I look and I have to say I'm starting to agree…I never have been very good at accepting complements! Lorna was always on hand to help - She even told me to send her a pic of a restaurant menu once to help me choose wisely when I was out! The Facebook page is so handy - Lots of help and encouragement from ladies in the same boat. Nothing is banned…everything in moderation…its all about balance. I have now learnt to FORGET what I think I know about ‘diet food’ and just eat clean and healthy…and keep up the exercise. 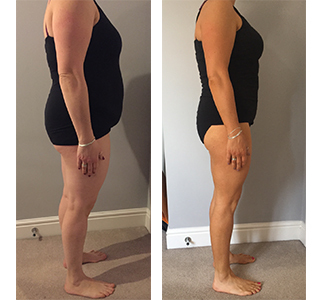 Give it a try - Its 8 weeks of your life that will teach you a life lesson…What have you got to lose…a few pounds and centimetres maybe?! AND I no longer hate running…!! Total CM's Lost 40cm overall! Forget what you think you know about "diet" food and re-educate yourself! Its not a faddy quick fix...its a way of life! Embrace everything the programme has to offer - learn as much as you can from it and you'll be able to keep going well after the 8 weeks has finished. This is just the beginning for me and I'm so excited! Were you inspired by Amber's story? If so why not start your own journey?